Performing should be the fun part of learning an instrument , and I've decided to make my students perform alot more regularly in any atmosphere I can get my hands on! I think learning an instrument is something that should be enjoyed not only by the student but for those around them. Its hardly useful to learn an instrument if for years on end the only person that really hears you is your teacher! Would you practice with a sports team for months to not play a game? Or prepare a science fair presentation and not participate in the show? Of course you wouldn’t! I feel that learning an instrument is the same way. Performing is part of the fun! Whilst all performance opportunities are optional, I think it's time everyone played more and encouraged everyone to perform more. Some opportunities are by audition only and are fantastic goals for our students to aspire too. 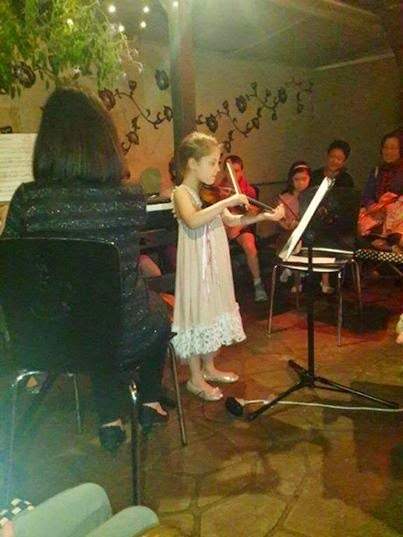 Others , like the recent student recital at Wild Hearts cafe are a great opportunity for students to have their first performances , air out a piece prior to an exam or give some students a deadline for learning something. Athletics has trophies, academics has awards and good grades. By creating goals to aspire to, students are motivated and can gauge their progress. I feel that live performances create internal aspiration and handwork. A teacher and student work together to prepare for the performance in a way that is designed to create an internal drive to improve! Well said! Getting students to perform regularly also builds on promoting a healthy self-esteem in children... The concert held at Wild Hearts Café was perfect for my shy and relatively quiet child. Well done!